Our stand up floor jewelry boxes are available in large and slim designs. From tall jewelry cabinets to sleek floor standing jewelry armoires, you'll find classic to modern jewelry box armoires that perfectly fit your personal style. 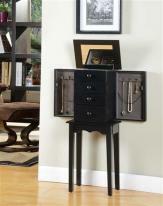 Our standing jewelry boxes are designed to hold large jewelry collections. Storage features include divided storage sections, luxurious lined drawers and swing out necklace doors with hooks for hanging long necklaces. If you have questions or don't see the floor jewelry box you are shopping for, give us a call or send us an email, we're here to help and are happy to answer any questions you may have.